If you are looking for really flexible cooking, Rangemaster’s Multifunction Oven is ideal. It uses combinations of the fan and the heating elements to create the right cooking environment for all your culinary needs. From defrosting, to crisping up the base of your pizza to browning your favourite pasta dish, the seven functions are designed to make your cooking experience easier and more versatile. 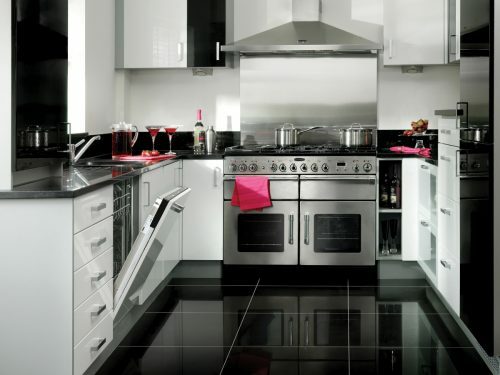 Find out more about Rangemaster’s multi-function ovens in this short video. No more scorching your hands on the oven cavity when you reach in for your roast. The Handyrack attaches to the main oven door, pulling the roasting tray out. All models of the Rangemaster Classic (featured below) come with a Handyrack and with the 110 model you’ll also benefit from a storage drawer for your baking trays. Create authentic Asian cuisine on Rangemaster’s Multi-Ring Burner, which can hold a specially designed wok cradle. This is a feature of the Rangemaster Excel (featured below), a range cooker which also offers two massive ovens, a separate grill and a dedicated slow cook oven. Positioned on smooth-action telescopic runners, Rangemaster’s Glide-out Grill does exactly that. Not only is it easier to check up on your food as it’s grilling, but it’s also safer as it reduces the risk of pulling the grill out too far. 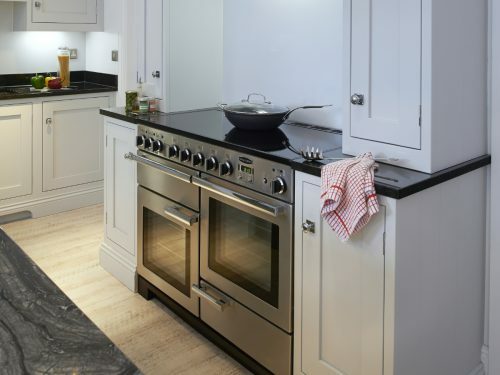 This is a feature of the chic Elise range cooker (featured below), which also features stylish controls and a continental flair for sophisticated design. Rapid Response preheats the oven 30% faster than a fan oven, so you don’t waste time waiting for the temperature light to go out before you can get cooking. Rangemaster’s tests show that you can place chilled foods in a cold oven, select Rapid Response, and get the same results as starting with a preheated oven. A feature of the Professional Deluxe (featured below) this feature allows you to get on with the cooking in an instant. Rangemaster’s Endurance finish is eco friendly, durable and will last for years to come. 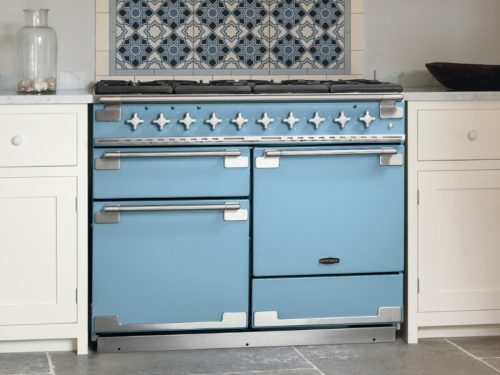 All Rangemaster range cookers use only environmentally-friendly, top-quality paints and enamels supplied by the global leader in the field, and applied at their factory in Leamington Spa. 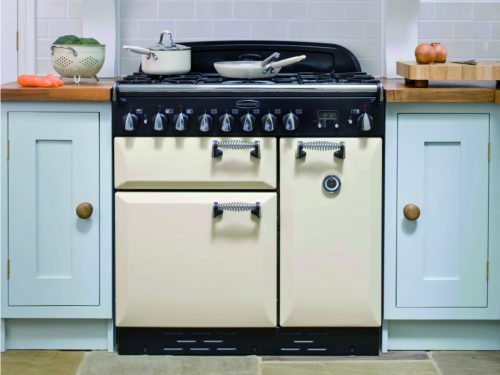 Featured below is the Elan, a classic range cooker which comes in various colour options and features spiral handles, lovingly crafted control knobs and generous curvaceous doors – just some of the finer details that set the Elan apart. These are just a few of the specialist features available in the Rangemaster range. To find out about more features, including Telescopic Shelving, the 4-Way Grill Trivet, the Griddle, the Multi-Zone feature and the Bread Proving Drawer, visit our showroom. Our destination showroom in Winkleigh, North Devon has a selection of Rangemaster range cookers installed in a beautiful kitchen environment. 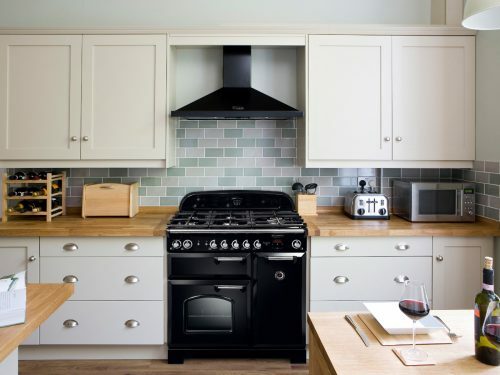 If you need help deciding which range cooker is right for you, our experienced team are on hand to talk through your requirements.